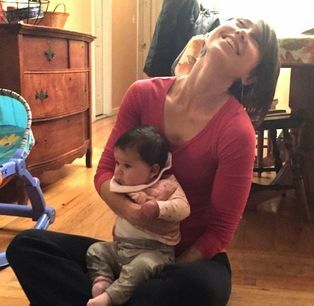 ​The yoga class at the Hempstead MOMMAs House was one of United We Om's first Karma Projects. Responding to the needs of the young mothers in residence at the home in Hempstead, each weeks class is slightly different. Ranging from restorative and gentle yoga to guided relaxation and yoga nidra, the class is a time for the women to be together in a space of calm and provides tools to reduce stress and reaction in their daily lives. Sasha has been teaching yoga for eight years and is one of the first United We Om Karma Project teachers. She is a mother of two and lives on Long Island, NY.